- When my aunt told me she was learning to knit socks, sock yarn, double- pointed needles, and patterns were sent her way. - When Ellen posted the details of the fourth edition of "De-stash and Do good", a box full of yarns was set aside for a good cause. - When one of my coworkers asked for a scarf in turquoise, I showed her a dozen skeins in the right color family and she chose the skein she liked the most. - When another coworker said she liked hand-knitted coasters, I had a dozen skeins that matched her living-room colors for her to choose from. Twelve coasters in Spud and Chloe Fine (white), Zen Yarn Garden merino/cashmere/nylon (brown), and Spirit Trail Paivatar (green). 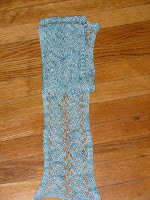 - When a fellow knitter wins a contest, I can find something in her favorite colors. And if a yarn and I need to part ways, I can always destash it on the KR forums or bring it to the KR retreat. So really, it's not that bad! Dearest Minh, you do not owe anyone REASONS you love your stash! (Or that I love your stash, either.) Whatever you collect makes you happy. And allows you to make other people happy. Sounds like a win-win to me. The politically correct person in me (who, admittedly doesn't get let out much) agrees with NutmegOwl - you do not owe anyone reasons to love your stash. The mad-stasher in me, the omg-why-is-this-room-such-a-mess organizer and the embarrassed project-completer thank you for writing.